All Products > "3354 GT Power G.T Power SD6 Balance Charger"
A great all-purpose compact charger that supports the majority of battery chemistries. Supplied with an UK AC power lead and a Deans (T-plug) charge lead. 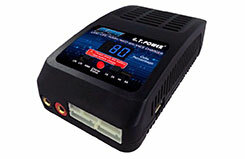 Other charge leads can also be purchased (see related products). Simple 2-button control, provided with full instruction manual. LED indicator shows charging progress.